I guess everyone has to start somewhere, right? While I have read several other novels by Salman Rushdie, which I loved, this one, which is his first published novel, just doesn't seem to make the cut. I have to say that this novel didn't give the best reading experience for me, knowing what his other books were like. It's not my most favorite Rushdie novel, and therefore if this book were the first novel of his I have read, I probably would not have read another Rushdie book. Hence, I am glad that my introduction to Rushdie's work was by way of four other novels, all of which I definitely enjoyed way better than this current one: The Satanic Verses, The Enchantress of Florence, Midnight's Children, and Shalimar the Clown. So what is Grimus about? 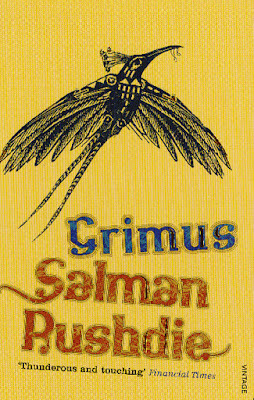 Grimus is a fantasy and science fiction novel published in 1975. It tells the story of Flapping Eagle, a young Indian who became immortal after drinking a magical potion. He has a sister, who also became immortal. Flapping Eagle then wanders the world for 700-something years, doing various things and visiting various places. And in the end, he becomes tired and wants to die. So, he ends up in Calf Island, which is this place where everyone who have become tired of the world but doesn't want to die somehow end up. There are a few characters here, who all interact with Flapping Eagle during his stay. Additionally, there is the character of Grimus, who seems to be the only one who knows how Flapping Eagle could eventually die. Hence, Flapping Eagle is on a mission to find Grimus, whoever he is, but the other inhabitants of the island don't seem to be interested in helping him with his mission. I won't say more about the plot, but let's just say it was rambling, unstructured, and frankly uninteresting. It reminded me of this bad novel I read years ago, entitled Wild Animus. There were several fantastic and other-worldly elements (perhaps I really am just not suited to reading fantasy) that this book springs on to the reader, and frankly, after several pages of those, I just couldn't care less. The thing is, in the other Rushdie novels, there were elements of magical realism, and in those worlds, the use of those magical realistic elements made perfect sense. Here, however, there were so many magical devices that were being introduced (especially in the final 40 pages), and it felt like they were only being introduced to make the point that this was a magical realistic novel. In Rushdie's later novels, the magical realism aspect of the novel was introduced early on (children born on midnight having superpowers, or two survivors of a plane crash morphing into an angel and a devil), and the book stayed within its assumptions. In Grimus, the assumptions just kept on changing as you turn the page over and over again. 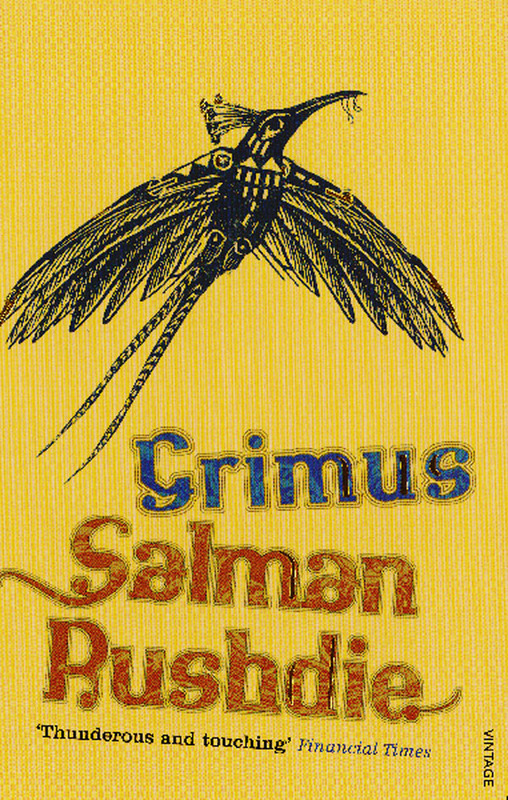 Hence, I couldn't help but feel like Rushdie overused deus ex machina as a plot device in this book, as new magical things were constantly being introduced, especially when Flapping Eagle finally reached the house of Grimus above the mountain in Calf Island. I have to say though, that even though this is a novel that I ended up not liking, there are a few redeeming factors I'd like to talk about. I guess it is a good thing that this novel was written, because who knows, without this novel, Rushdie might not have had the chance to perfect his art, and his later masterpieces might not have been written. This novel perhaps illustrates what doesn't work, so that later novels didn't repeat them. I can identify traces of motifs that are also present in later works. For example, Rushdie already have paired characters here: in later works, plenty of his characters are paired, with one being good, the other being evil. One being the protagonist, the other being the antagonist. Examples of this paired character are Saleem and Shiva in Midnight's Children, or Gibreel Farishta and Saladin Chamcha in The Satanic Verses. In Grimus, you have Flapping Eagle paired with Grimus himself. Overall, I guess I should say that I appreciate reading the book not for its contents, but for the fact that it provides an insight to the other novels Rushdie have written which I enjoyed reading. Definitely don't read this as the first Rushdie novel if you haven't read any of his other books and are not familiar with his writing style. This is a bad introduction to his work. But if you already have read several of his other novels and want to see where it all began, then by all means read this one. I am giving this book 2 out of 5 stars. I heard a documentary about him recently and while I have heard of the whole fatwa business, I have never read his books. I may not start with this one, though. Definitely not. The other books I mentioned above are way better introductions to his writing style. And yes, I whole-heartedly recommend you to try them!